GET UP! KISS Live in Whistler!!! STAND UP! | Muddbunnies Riding Inc.
GET UP! KISS Live in Whistler!!! STAND UP! As September comes to Whistler/Blackcomb, The Big Mountain Concert Company will turn up the heat as they stage a rare, outdoor appearance by KISS on Vancouver’s own Olympic mountain. This incredible concert will be the first of 3 extravagant weekends at Whistler starring big-name international artists. KISS is one of the world’s biggest rock bands and they have played more than 3,500 concerts in front of 78 million fans around the world. “We’re absolutely thrilled to be playing host to this legendary band” said Whistler mayor Ken Melamed. The world famous rockers will transform the entire Resort Community of Whistler as they take their extraordinary show to the slopes of Blackcomb Mountain at the Coca-Cola Tube Park on Saturday, September 15th in a unique one-time outdoor concert event. KISS invented stadium rock with their sci-fi Kabuki costumes, outrageous theatrics and, of course, their trademark make-up. In their extensive world tours KISS have cultivated the most loyal fan-base in music known as The Kiss Army. The stunning showmanship this band brings to the stage is overshadowed each time by their huge body of music. Destroyer, Rock and Roll All Night, Love Gun and Alive became the soundtracks for an entire generation of fans. KISS have sold 80+ million records throughout their career, and have earned more than 55 gold, platinum and multi-platinum awards since receiving their first gold record for KISS Alive! in 1975. 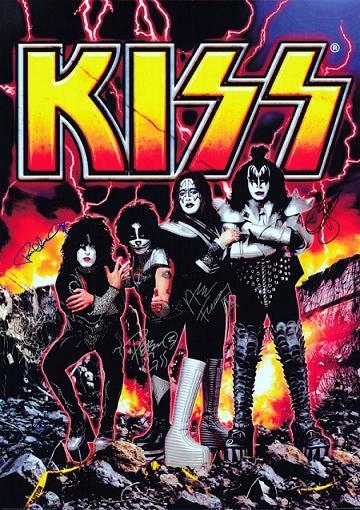 KISS rocked 800 million viewers at Super Bowl XXXIII, breathed fire into the closing ceremonies of the 2002 Winter Olympics and welcomed the New Year in Times Square for four consecutive years. Now they are ready to rock Whistler. KISS: The End of the Road World Tour is here – Grab tickets for the whole family today! Concert tickets are trending and the rate is really cheap tickets in Canada.